gitaneusa.com :: View topic - Purple Interclub - 1974? 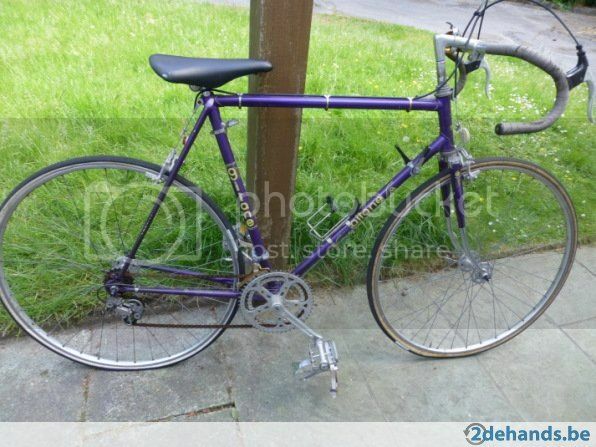 gitaneusa.com Forum Index » Vintage Gitane » Purple Interclub - 1974? It's been a while, but I've got me a new project here: 1974 Gitane Interclub (I guess - it has the same Huret spiderweb dropouts as my '74 Super Olympic, but 'newer' decals); a bit on the heavy side (being a gaspipe frame), but I could not resist the colour. Pretty good condition overall except for the FD, saddle (ouch! ), chain, shifters and some other stuff. Comes equipped with mafac racer brakes, Simplex Prestige s001 derailleurs, Sugino Maxy cranks, Atom pedals and tubulars.